I didn’t grow up on the village streets of Colborne, or the country roads of Cramahe Township, but my children did. My ancestors were not among the pioneers. But it was my joy to live in Colborne for 22 years and to raise my family there. And it was my great privilege to be entrusted with the job of being editor of the Colborne Chronicle from 1979 to 1997, serving the village and the township. Although I have made my living by words for the past 20 years, I have no words to describe my feelings for Colborne and Cramahe. If this place is not my hometown, then I have no hometown. In 1984, I prepared a supplement of the Colborne Chronicle, a special heritage edition to celebrate the 125th anniversary of the incorporation of the Village of Colborne. Both projects were labours of love, and the work I did on them formed the skeleton for the book you hold in your hands. 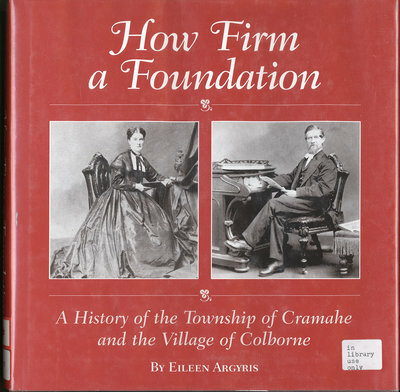 It had long been my dream, as writer and adopted “local,” to give Colborne and Cramahe a history book all their own. The advent of the re-amalgamation of the two municipalities into one – as they began – and the turn of the millennium from the 20th to the 21st century, presented that opportunity. On a cautionary note: in my research, I uncovered so much material that a book five times this size could easily have been written. However, there must be an end somewhere, and within those limitations, I have included as much of what I judged to be the most relevant information available to me. I can only hope the reader agrees that the text comes together as a coherent whole, and gives them some feel for the times, places and people described. When you travel through the village and the township after reading this book, it is my hope that you will do so with awareness of those who have gone before, in whose footsteps we walk; to be aware of the hopes and dreams and the sheer effort that shaped these communities. Although they are not historic but new, I have used civic addresses wherever possible to describe locations. In this way, I hope that the points of interest will be identifiable for an indefinite period into the future, and that readers of the book – newcomers and old-timers and everyone in between – will truly be able to look at Colborne and Cramahe Township through “old” eyes. The title, How Firm a Foundation, is also the title of an old hymn. It is meant to reflect the strong faith that sustained the pioneers and is their legacy to us, no matter what our religion. The subtitle is deliberately chose: “a history,” not “the history,” since there are so many stories to tell which are part of “the” history, but just didn’t fit into this one. This book comes to you with my very best wishes for the future, whatever your interest in Colborne and Cramahe may be, that you may know and cherish the memories of those who have struggled, succeeded and failed, known triumph and heartbreak on these hills, fields, homes and streets. Copyright: Cramahe Township Public Library owns the rights to the archival copy of the digital image.